Be in A7X’s Next Music Video!!! 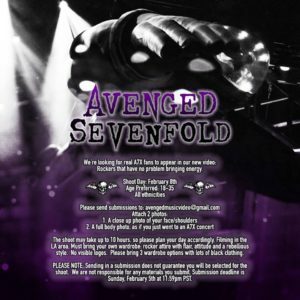 Do you want to be a part of Avenged Sevenfold history? Well, according to their Facebook page, the metal-gods are looking for real A7X fans to appear in their next music video. Avenged will film the video for the undisclosed song on Wednesday, February 8 in the Los Angeles area. They’re requesting real A7X fans that have no problem bringing energy. Avenged will have no shortage of fans bringing plenty of energy this Summer as they headline Rock Fest in Cadott, WI. They’ll join fellow headliners Rob Zombie and Slayer for the festival July 13-15. Avenged’s last music video was for the title tract of their 2016 album The Stage which debuted at No. 4 on the Billboard 200 album chart. The album features a different direction by the band with an Artificial Intelligence theme. The submission deadline is Sunday, February 5 at 11:59 PST.